SO sorry to have been absent the last month. I can honestly say that Katie's Senior Year has kept me busier than I could have ever have imagined. There has been so much to do, so much to pay for, lol, so much to prepare for! 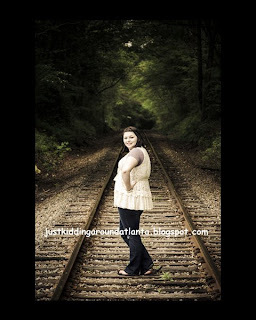 One of the best parts of Senior Year was getting Katie's pictures taken this Spring. Ummm, well - first, let me tell you about the bad experience with the school photography company last Fall. All I can say is they were AWFUL. Truly. 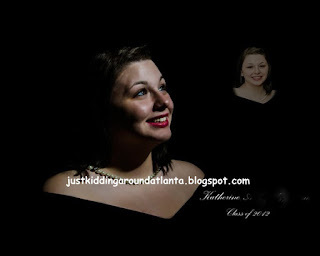 Her drape/pearl senior pic was really bad - they had her hair stuck under the pearls, and it was so messy looking. There was no way to fix that or airbrush it. And the casual photos - the poses were terribly unflattering. I have a beautiful girl, and I wanted her pictures to show that. They didn't, and I was so mad. 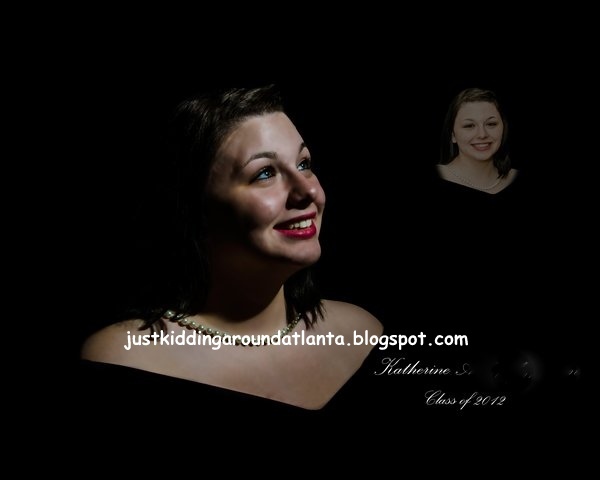 You look back on your Senior picture forever!! 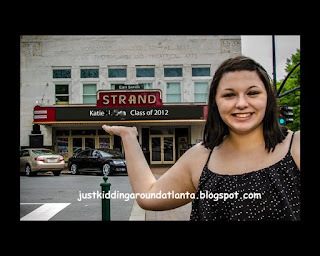 It's in your yearbook, and will one day show up on your nametag at class renions, lol. So you want a beautiful picture. I was really ticked when they sent the proofs with the price list - almost $300 for the smallest package - really?! There was no way we would be buying those pictures! Luckily, I have a very sweet friend (hi Gaye!!) whose daughter is a photographer. 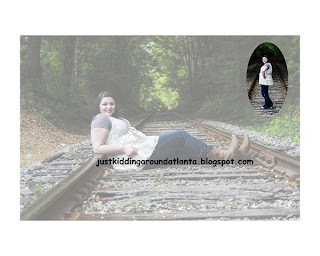 Elysabeth & her husband Jeff own J and E Kapas Photography here in the Atlanta area. 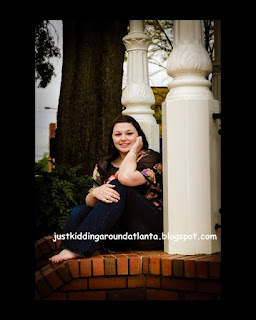 Elysabeth put together a Senior photo shoot for Katie on the Marietta Square. She even had a plan to recreate the drape/pearl picture - yay! At the end of March we met in Marietta, where she and Jeff took some really beautiful pictures of my baby girl. Since we live over an hour away from them, Elysabeth did a lot of the follow-up work via email, which was really wonderful. A few weeks later we met to pick photos for printing, and take home the actual photos. Jeff did an extraordinary job with the special effects. We purchased a CD to go with our package, and Jeff had worked his magic on there. We had black and white versions of each picture, sepia toned copies, black and white with color tinting, special lighting effects, and more - it was fantastic! I was so happy with these pictures. So allow me to show off some of my favorites and let me know what you think!! As a special bonus just for my readers, J and E Kapas Photography has a free gift for you!! You will receive 1 8x10 & 8 wallets FREE with ANY photo package purchase. That's a $22 value, free! 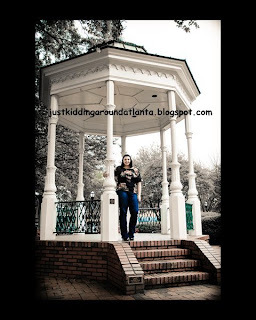 Just mention my blog when you book your photo shoot! :-) Thank you, Elysabeth & Jeff!! They will happily photograph your weddings, birthdays, newborns, maternity or family pictures - you name it! They are really creative and good at what they do. If the perfect shot requires them to shoot from the ground, they will - no problem! 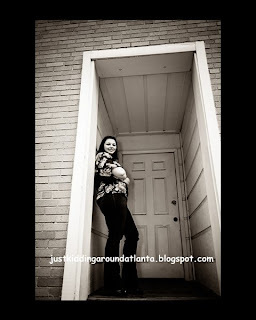 Finding the perfect doorway, or the perfect brick wall for a backdrop -consider it done! Seriously, I can't say enough good things about them. 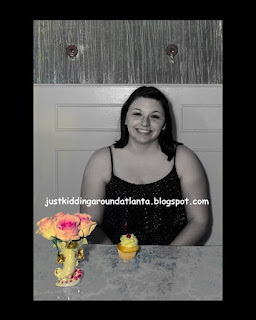 They were a godsend when we facing the prospect of really bad Senior pictures from the school! If you are in this area, I highly recommend them. You can reach them via email at jandekapasphotography@gmail.com. Disclaimer: J and E Kapas Photography offered us a photo shoot and CD at a reduced rate in exchange for a blog review ~ and all opinions are honest and my own! I love the job they did and the work they put into making these pictures so good. They are also providing a free offer to any of my readers who mention this blog post and purchase any package from them.